Kirby is often overlooked when compared to other Nintendo mascots. His adventures aren’t as grand as some of their other well-known faces. But if the World of Light mode in Super Smash Bros. Ultimate has shown us anything it’s that you should never underestimate the little pink puffball. There’s something about him that is endearing, a certain charm that has earned him a loyal following from fans, who eagerly await his next adventure. Sadly his latest adventure is one you’ve all probably played before. 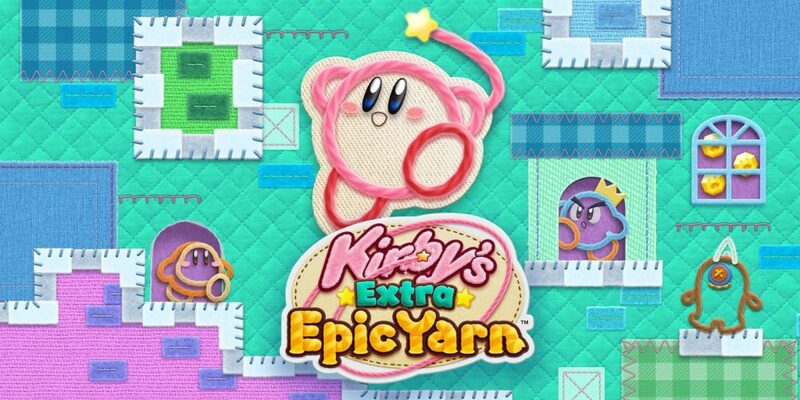 The latest in what seems to be the Nintendo holding pattern of releasing deluxe versions of games on different systems, we have Kirby’s Extra Epic Yarn. But unlike Mario Kart 8 Deluxe or New Super Mario Bros. U Deluxe, where titles that were made on the WiiU, and likely missed by many, were reintroduced to a larger audience on the Switch, this one is a remake for the 3DS based on the Wii game Kirby’s Epic Yarn. You’d be forgiven for thinking that remaking a Wii game from 2010 and releasing it on a handheld system nine years later despite said handheld having been around for eight of those years, sounds a little muddled. But it’s fitting, given that’s exactly how it feels to actually play. The base experience of Kirby’s Epic Yarn is all present and correct, with everyone’s favourite pink protagonist having to join forces with Prince Fluff to save his native Patch Land from the evil of Yin-Yarn. Just like the original, Kirby’s signature ability to swallow enemies and take on their characteristics has been removed, and replaced with the ability to change into certain shapes at will to help traversal. This could be a car to zip faster across land, or a submarine to help with underwater movement. 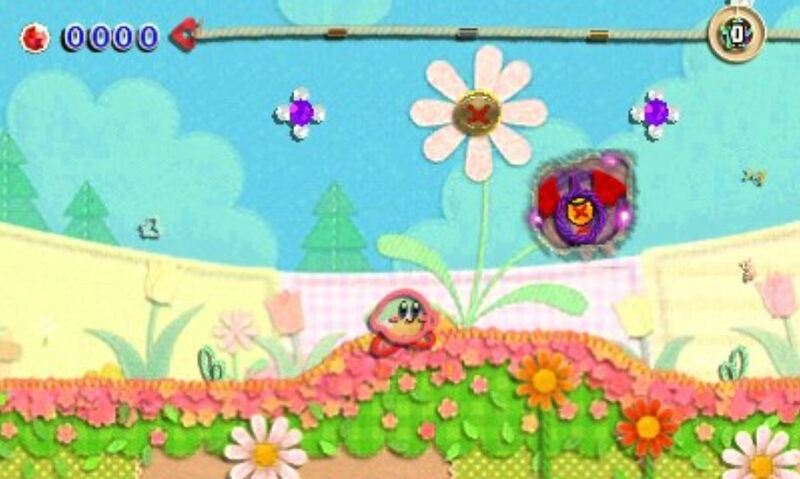 There are also special points in levels where Kirby can change into special objects unique to that level, which could be anything from a train to a UFO to overcome various challenges. A lot of the charm of the original was in the art style, with the use of yarn and craft material to make up the landscape. The look and feel of the game carries well onto the 3DS, although there are a few areas where it feels noticeably rougher around the edges, but never really enough to detract from your enjoyment. By and large the cute aesthetic and great level design shines through with aplomb on the 3DS. This coupled with the gorgeous, lovable soundtrack of the original again succeeds in making you all warm inside and want to press on and see what lies ahead. The final world in particular giving a shot of nostalgia and familiarity to proceedings. So far so good, but what makes this title “extra” compared to the Wii original? Well the first addition is an attempt to address the issue of difficulty that hangs over Kirby games like a bad smell. Yes Kirby games are easy, and Kirby’s Epic Yarn was no exception. To combat this, a new “Devilish” mode has been added to each level. Any level played in this mode is exactly the same as normal, except for one small difference, a small purple creature appears and follows you around the level trying to drop black spiked balls on top of you. It can be removed for a bit with a well-timed attack but will return after a short while to torment you until you reach the end of the level. The idea being that if you can survive the level without being hit (by any creature including this purple winged nemesis) you gain up to five life pieces for your collection. Each hit in a level reduces the number you take home by one, and with the 50 levels here, that makes a whopping 250 to collect if you can avoid being hit. Difficult? Certainly, but enjoyable and worth it? Probably not. For collecting certain amounts of life pieces across the levels you unlock gifts in the form of more collectable furniture for your house, which was arguably the least engaging part of the original. Yes, the nagging completionist inside of me is drawn to trying it, but after a while you realise Devilish mode is just pest mode in all but name as you swat away at this frustrating fly whilst trying to enjoy the main game. All in the name of “difficulty” and for arbitrary decorative rewards you’ll likely never use. There’s also a couple of new minigames thrown into the mix for when you fancy a change of pace from the main story. And I use the term pace deliberately, because often the main story can feel a little slow, akin more to a steady treasure hunt than a challenging experience. In these minigames speed is definitely the name of the game. Depending on which one you choose, you either take the form of King Dedede or Meta Knight and have to race through levels at speed collecting items and/or killing enemies. The King Dedede version is a side-scrolling runner, where you have to collect beads and avoid obstacles with the latter reducing your bead amount whenever you touch them. Reaching the end of the level with a certain score affects your rank. The Meta Knight version is similar but is more of a slasher-race, where you can move more freely across the whole screen, and a timer is ever counting down to game over. To extend your time, you need to quickly dispatch of enemies. More time equals more opportunity to collect beads, and again you’re ranked when you’ve finished. Higher rankings earn (you’ve guessed it) more decorations, but the main reason for these minigames is more for a fast-paced buzz that the main story is often lacking, and they serve a decent job, There’s four levels in each which are unlocked through the main story progression, and can be played at any time once unlocked. 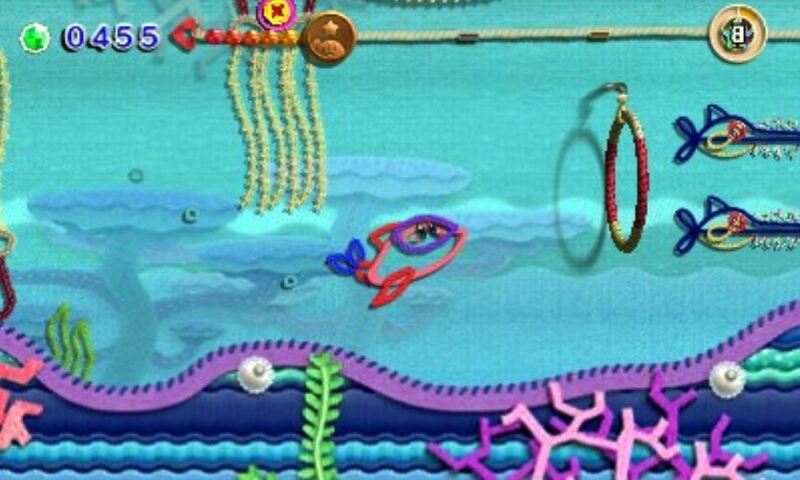 Perhaps the biggest shake-up to the 3DS remake though is the inclusion of Ravel Abilities. These come courtesy of hats that Kirby can acquire throughout the various levels and give him unique abilities. One allows him to brandish a sword and attack enemies, another to shoot pins at enemies from afar. By and large these serve as an additional way of killing enemies or destroying blocks in the level, and most are largely interchangeable, albeit with different nuances. All except the Nylon hat, which ultimately breaks the game. This hat not only gives Kirby the ability to attack enemies at close range, but it also acts as an extra jump giving him extra height, and to top it all off, when activated draws all gems nearby to flock to Kirby. Now, in a game that is about platforming, beating enemies and collecting gems, that’s a pretty big buff that makes all three much simpler. And when you add in the fact that these original levels were designed without these Ravel Abilities, you soon find yourself skipping parts of levels inadvertently because you now have extra height, or you won’t have to make that death-defying platforming leap to collect gems, because they now come to you. It makes an already simple game, trivial, and undermines some of the excellent level design on offer by providing you with an all-powerful trump card. Also, given that Ravel Abilities carry over to future levels with you, I’d find myself dodging the offerings of new power-ups just to keep my Nylon hat. And when you’re running away from power-ups, you know you’ve gone wrong somewhere. 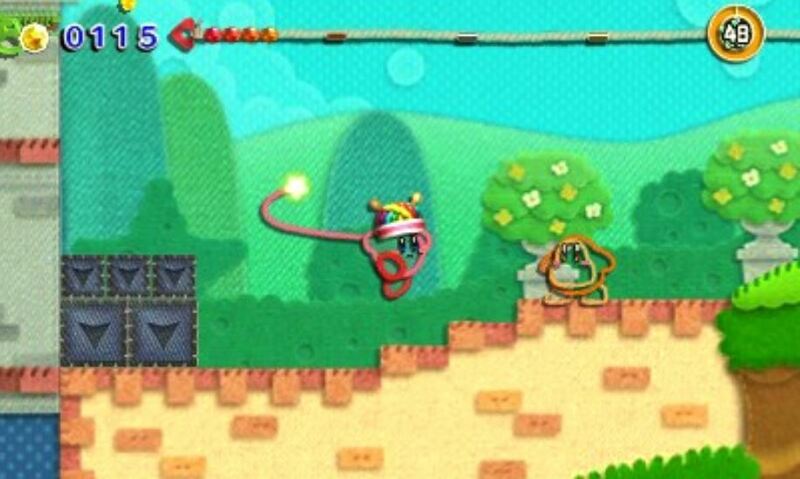 So that leaves Kirby’s Extra Epic Yarn in a bit of a weird position. There’s no denying that the original on the Wii was an excellent title, full of unique charm, solid if simple gameplay, a cute aesthetic and some top-notch level design packed with ideas. And by being that game and more, Kirby’s Extra Epic Yarn should be just as good. Except it isn’t because the additions do very little to add to the experience to excite fans of the original or force those that passed up the Wii version nearly a decade ago to take the plunge. And some of the additions, most notably the Ravel Abilities actually undo some of the good work on the level design by over-simplifying the experience. And then there’s the point of time. It’s been nine years since Kirby’s Epic Yarn, and by not moving forward much with its offering in that time, it looks out of touch. Since then, we’ve even had its spiritual successor in Yoshi’s Woolly World and have the sequel Yoshi’s Crafted World to look forward this very month. And the 3DS doesn’t even offer much as a platform of choice here, with no 3D image support. It does have Amiibo functionality for select Kirby franchise Amiibo should you want easier access to Ravel Abilities. But I can’t help but wonder if only Nintendo had a more powerful handheld console, that also had Amiibo support, could easily handle Wii-level graphics and more, and could have facilitated better additions like maybe some new levels, or a better designed hike in difficulty than an arbitrary nuisance flying around. Yes, this really should be on Switch, and the decision to publish it on the 3DS hampers it’s execution as well as denies it the scope to really build on the original. If you who wished you had played the Wii original, but never got the chance, and have sold your Wii, but still have your 3DS knocking around, then maybe this version is for you. It is a solid platformer with some good ideas. But for everyone else it will feel like a strange release that for all it’s good intentions is probably best left alone. Better to cherish the original memories than potentially tarnish them with muddled extras on offer here.